2019 is the year of the Pig, the twelfth and last sign of the Chinese Zodiac. Legend has it, that the Pig arrived late to the Jade Emperor's Party because he overslept, and therefore was placed last in the Zodiac. 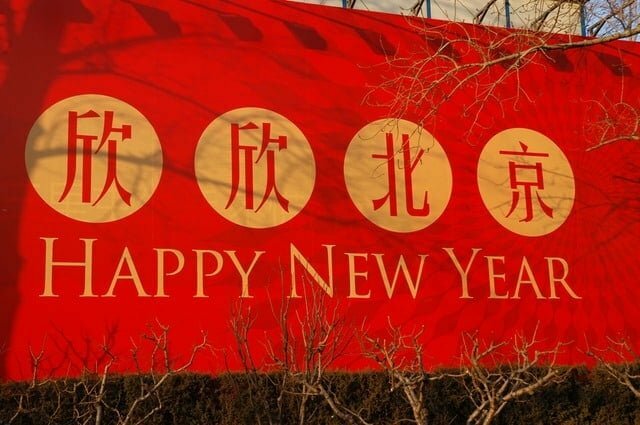 The Year of the Pig begins on the 5th January 2019 and marks the start of the Chinese Spring Festival which ends on February 19th. The Pig is a symbol of wealth and fortune (those chubby little faces give it away), and those born in the year of the Pig are said to be warm-hearted, good-tempered, loyal and honest... albeit a bit lazy at times! Your lucky colours are gold and yellow and your lucky numbers are 2, 5 and 8. But be aware, your unlucky colours are red, blue and green. 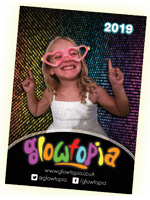 Whether you're born in the year of the Pig, or you are planning to hold your own festivities to mark the start of the Chinese New Year Spring Festival, have a quick read through of our ideas of things to make, do, show and glow. So if you were waiting for an excuse to make some crafty stuff (with or without the little people), or want an excuse to go crazy with the take away at your local Chinese, and a party seems like the one then read on! This one is super easy and a perfect craft for kids. With a little grown up detailing and embellishment they can also look pretty cool for grown up dinner parties too. 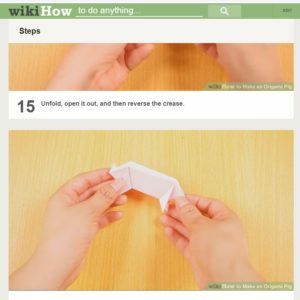 All you need is some card or paper, scissors and either glue, sticky tape or even a stapler... that's it! 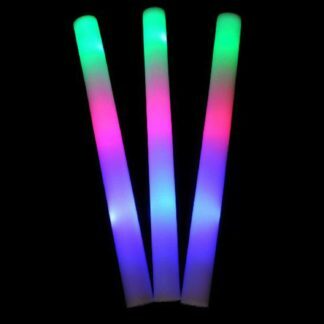 To add some GLOW power, you'll also need either glow sticks or an LED tea light. Obviously being the year of the Pig, you'll want to bring some luck into the makings, so either get some yellow or gold paper or card, or decorate a white or black sheet with yellow paints, pens, embellishments - we love gold marker pens and fine liners to make chinese letterings, but for a real splurge go for gold origami papers or craft / scrapbook papers, both available in a wide variety of plain or patterned designs, textures and finishes. With your chosen paper and scissors at the ready, cut a 1/2 strip from the short end of the paper for the handle. Fold the paper in half along the long edge - you want to have a horizontal fold line in the middle of the lantern once it is put together - and keeping the scissors at the folded edge cut along the folded paper towards the open edges, evenly spaced and leaving approximately 1/2 inch uncut at either end. How you space the splits depends on the look you want and the size of the paper - the more slits the more light shines through, but they will be less sturdy. Use a pen and a ruler if you want it to be symmetrical. 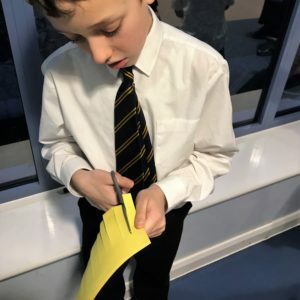 Open the piece of paper, and apply some glue or tape to one of the short edges where the slits end, curl the paper around and join to the opposite short edge. If using a stapler simply staple at the top and bottom after making the curl. 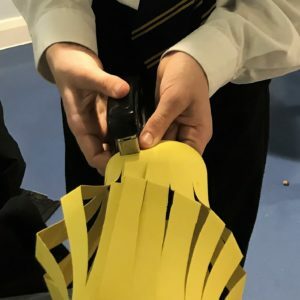 Attach the handle by placing one end of the strip inside the top of lantern, curling it over, and attaching it to the other side of the top of the lantern - again using glue, sticky tape or staples. And that's it, a super simple lantern. For a standing lantern, use an LED tea light and place the lantern over it - please do not use real candles, they are a fire risk! 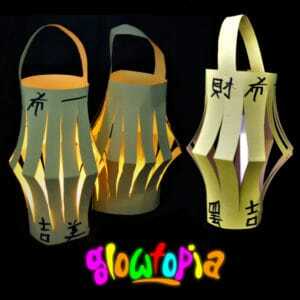 If you are hanging the lanterns and still want the glow, all you need is some 4 inch or 6 inch glow sticks. Cut the included lanyard to size, make a hole where each handle is attached to the lantern, and thread the lanyard through the holes. Cut the length and tie with a knot to keep it in place. If you were already using a stapler or sticky tape, you could also attach the lanyard thread with these. Another quick and easy decoration for the home or garden and suitable for both adults and children are coloured tea light holders. They are cost effective and make really pretty table centrepieces and ornamental decorations for lots of events. 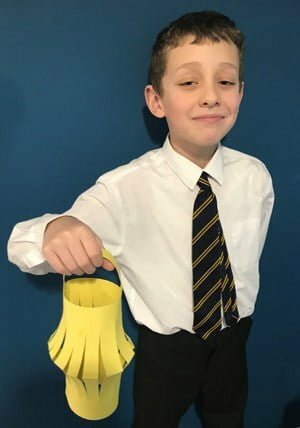 The simplest version is the Paper Bag Lantern - Super popular for outdoor events and weddings and all you need are paper bags and LED tea lights or glow sticks. If you want to get an extra Chinese New Year spin on them you only need a few simple craft supplies to transform them. For kids, we quite like the idea of using pink paper bags like loot/party bags in pink, and drawing (or if you are super committed, try cutting out) a pig design. 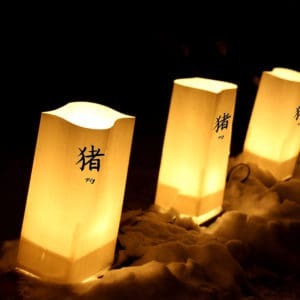 Alternatively, buy yellow paper bags and write the Chinese symbols for "Happy New Year" or "Pig" in black felt tip pen. If you are happy to stick with the plain white paper bags, you can decorate them with paints, tissue paper, pens and decorative punches, or leave them plain and pop in a pink or yellow glow stick instead. 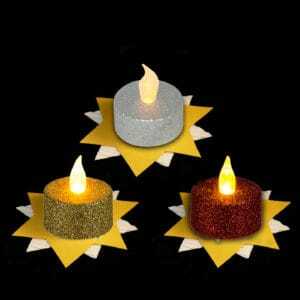 Next you can cut out simple star shapes from card or paper - again we like yellow the best, and using a bit of double sided sticky tape, attach the stars to glitter LED tea lights to make a super quick but effective tea light decoration. 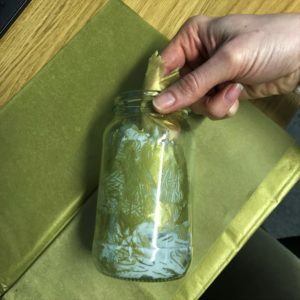 Lastly, if you want to put a little bit more time into the crafting, get yourself some yellow or gold tissue paper, PVA glue and up-cycle some jam jars. Tear the tissue paper into rough square pieces and glue to the inside of the clean jars. Pop in your LED tea light or glow stick and you have a pretty lucky coloured tea light holder. 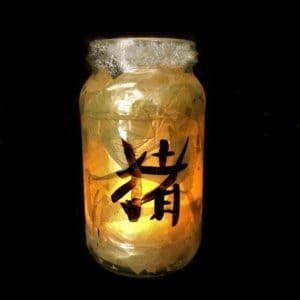 We like to add a bit more sparkle and detail to our tea light jars, so we added a gold glitter glue detail to the rim and added the Chinese symbol for Pig to the outside. 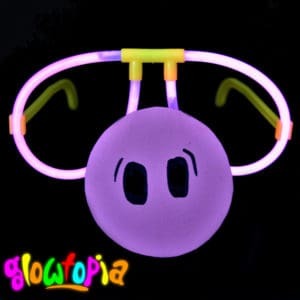 We love crafting up ideas for unique ways to use our Glow Sticks and Glow Stick Novelties, and we are especially pleased with our Piggy Power Glow Stick Glasses. This is a really simple craft idea for kids that they will absolute love! 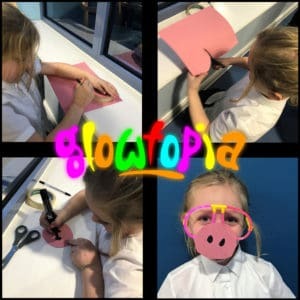 All you need is a pair of Pink Glow Stick Glasses, pink paper or card, black marker pen and sticky tape. Using your sticky tape as a template, draw a circle on the pink paper or card. Cut out the circle and draw two oval shapes in black pen. 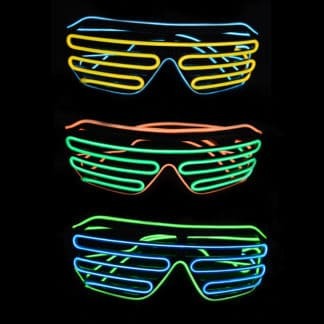 Activate the glow sticks and assemble the glasses. Finally, using the sticky tape, attach the paper snout to the glasses, and you have a pigging perfect pair of piggy glowing glasses!! No Chinese New Year celebrations would be complete without a little bit of Origami. 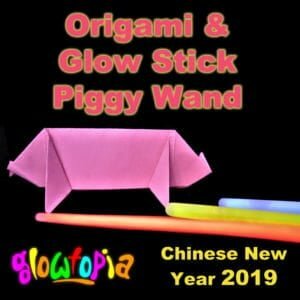 So we got our heads together to try and think of some ways we can make an Origami Piggy glow.... and well we are pretty impressed with our resulting Origami Piggy Glow Stick Wand! But if wafting wands isn't really on your agenda this Chinese New Year, fear not, we think these are pretty spectacular when used for flower pics and balloon sticks.... or forget the holding stick and pop a glow stick in the body and use it as a little light decoration. Depending on your creativity, skill and age level, there are a lots of different designs you can go for. We loved this free standing pig posted by wikihow; the steps include photos and videos, its not too complicated and it looks awesome! Once you've made your Origami pig, all you need is a glow stick of your choice and attach it into the underside opening with sticky tape - you can use 12 inch Premium Mega Glow Sticks for a sturdy, long lasting superior glow, or if you're on a budget or making these for a class of children, our 8 inch Glow Stick Bracelets are a great cost effective alternative. 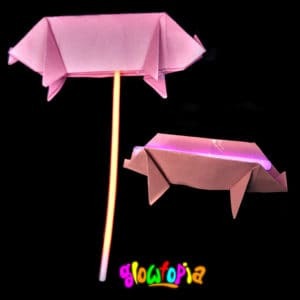 To make the Origami Pig Light, we just used a 6 inch Premium Glow Stick, but you could use our 4 inch Glow Sticks instead depending on the size of your finished folded pig. The last idea we had make for great decorations for the kids. 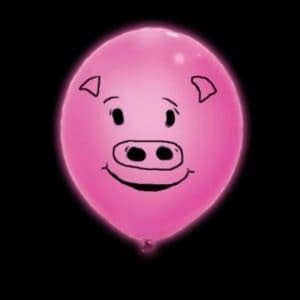 We took our ILooms Pink LED Balloons and our Premium Neon Pink UV Balloons to make these ultra cool illuminated balloons. 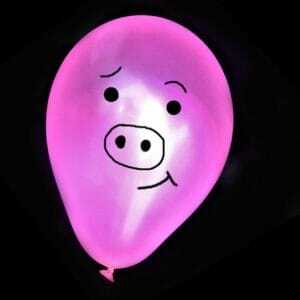 Its so easy.... just inflate the balloons and draw on a cute pig face, pig chinese lettering or whatever pig designs you can imagine. That's it! We hope you have enjoyed this Blog, and most importantly we hope that you enjoy the celebrations. Happy Chinese New Year from the team at Glowtopia!